We’d love your help. Let us know what’s wrong with this preview of The Number Sense by Stanislas Dehaene. To ask other readers questions about The Number Sense, please sign up. This is the earliest of Dehaene's three books about the brain and how it supports mathematics, reading, and consciousness. I have read these books in reverse order, beginning with the latest, Consciousness and the Brain: Deciphering How the Brain Codes Our Thoughts, an epic up-to-the-minute treatise that spares no detail, and which is a model of excellent scientific writing. His earlier book on reading, Reading in the Brain: The Science and Evolution of a Human Invention, was written in a simila This is the earliest of Dehaene's three books about the brain and how it supports mathematics, reading, and consciousness. I have read these books in reverse order, beginning with the latest, Consciousness and the Brain: Deciphering How the Brain Codes Our Thoughts, an epic up-to-the-minute treatise that spares no detail, and which is a model of excellent scientific writing. His earlier book on reading, Reading in the Brain: The Science and Evolution of a Human Invention, was written in a similar way, and again, is thoroughly educating without an unwelcome excessive "dumbing-down," which is so common in much of modern popular science writing. 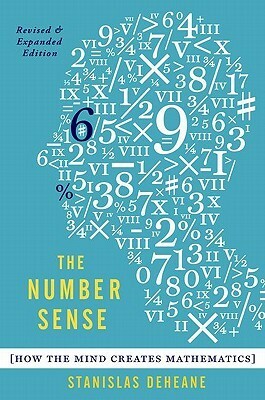 The Number Sense: How the Mind Creates Mathematics, Revised and Updated Edition is written with the same expertise as his later two books. Still, the material is somewhat dated (1998 for the original edition). Dehaene does add a new final chapter updating the state of knowledge to 2011. It would have been better for the reader to have wholly rewritten the book, integrating the new last chapter into the relevant older sections, thus relieving the reader of having to stitch and replace the new data onto what he might have remembered from the old. My interest in the various chapters was somewhat uneven and they seemed scattered. Those covering the basic (rather simple) hypothesis on number sense are essential. Then, Dehaene spends too much time covering how a child's mathematical ability increases from birth to adolescence. His motivation is clear: he rails against the failed "new math" teaching of the 1970s, and rebuts that pedagogy with opposing scientific data. Good historical background, indeed, but we're past that true educational disaster now, I hope. Then...there is a fascinating chapter on the nature of mathematical prodigies, and the calculating techniques which they use, that "flew by." Excellent, but too short. The last part of the book covers brain imaging and locating those brain areas responsible for particular math abilities such as numerosity recognition, number comparison, addition/subtraction, and calculation. I admit to jumping to the conclusions here: in his books on consciousness and reading, cited above, Dehaene goes deep into PET and fMRI imaging for those activities, presenting it very well and convincingly. Therefore I was already prepared to accept the application of the same techniques to mathematics processing, and go directly to the summary results without reading all the details. I don't know of any practicing research scientist, in any field, who is writing books for an educated, intelligent public, that does it better than Dehaene. I can't wait for his next book, whatever it might be. One day, a group of friends of mine and I somehow randomly came up with this random question: how universal are numbers and mathematics? Why is it that all cultures seem to have some concept of numbers? So we came up with this game, we would agree not to use any number for a day to find out how hard it was. And holy crap, it is ten thousands times harder than we could ever imagine, not only because we were a bunch of physicists, but even simplest things like: what time is it? where’s your house? One day, a group of friends of mine and I somehow randomly came up with this random question: how universal are numbers and mathematics? Why is it that all cultures seem to have some concept of numbers? So we came up with this game, we would agree not to use any number for a day to find out how hard it was. And holy crap, it is ten thousands times harder than we could ever imagine, not only because we were a bunch of physicists, but even simplest things like: what time is it? where’s your house? became unbearably difficult to express. So we tried to figure out a way to express our ideas using other concepts. For example, if you want to say it’s 10 a.m, you say the sun is at that or that position. Or you want to say your house is 15 min away, you say follow this road, turn right at this tree, stop at that white house with a cactus in the garden. If you have 10 sheep, maybe you can name all of them, and when one is missing, you can go: hah! Bob has gone missing today. But having 100 sheep will really cause you a headache. We gave up after a few hours. So i was thinking about this problem for a very long time. How universal are numbers? Do we have an innate sense of numbers? How would life be without them? would it even be possible? I never knew if anyone had come up with the same question but i randomly found this book, which i thought would be very interesting. And it is. "The squirrel that notices that a branch bears two nuts, and neglects it for another one that bears three, will have more chances of making it safely through the winter." page 23 I'm not sure I agree with this statement. I believe that the squirrel that gathers nuts from the branch with 2 nuts AND also from the branch with 3 nuts will have 5 nuts (2+3=5) and therefore have more than 3 nuts, and the BEST chance to survive. I'm not arguing with the author on whether animals have number sense (as I "The squirrel that notices that a branch bears two nuts, and neglects it for another one that bears three, will have more chances of making it safely through the winter." page 23 I'm not sure I agree with this statement. I believe that the squirrel that gathers nuts from the branch with 2 nuts AND also from the branch with 3 nuts will have 5 nuts (2+3=5) and therefore have more than 3 nuts, and the BEST chance to survive. I'm not arguing with the author on whether animals have number sense (as I think the evidence shows they do), just that this particular statement doesn't make sense to me. I'm geeking out a bit over the fact that David Premack's work is mentioned in this book. Premack's Principle is also known as "Grandma's Law" ie: First eat your meat then you can have your pudding. (First eat your vegetables then you can have dessert). A high probability behavior (ie: getting to eat dessert) will reinforce a lower probability behavior (ie: having to eat your vegetables). I use this daily in my work as an applied behavior analyst...and as a mother. In this book, Premack's work is mentioned in relation to experiments with chimpanzees where, "When the sample stimulus was made of one-quarter apple and one-half glass, and the choice was between one-half disc or three-quarters disc, the animals chose the latter more often than chance alone would predict. They were obviously performing an internal calculation, not unlike the addition of two fractions 1/4 + 1/2 = 3/4. Presumably they did not use sophisticated calculation algorithms as we would. But they clearly had an intuitive grasp of how these proportions should combine." page 25 So this makes me think...if chimpanzees have the ability to add fractions (even while avoiding "sophisticated calculation algorithms") why can fractions be so difficult for people to learn in school. My hypothesis is that we move in with the "sophisticated calculation algorithms" too soon, which causes children to tune out their " intuitive grasp of how these proportions should combine." We as teachers/parents should spend a whole lot of time, during the early years, showing pictures and real world examples and 3D examples of fractions for children to explore and learn much in advance of adding the "sophisticated calculation algorithms." page 34 "Fuzzy Counting" The author refers to Alice in Wonderland when the Red Queen asks her, "'What's one and one and one and one and one and one and one and one and one and one?' 'I don't know' said Alice, 'I lost count'...Presumably although she lacked enough time to count verbally, Alice would have been able to estimate the total to within a few units." Trying this with my own children...and reading a normal speed, without a heads up to "count" (I just told them to "listen carefully...ready?") they both got 10. Very cool. "The chimp, therefore, learned to recognize the digits, 1, 2 and 3, and the point to the appropriate digit when it saw the corresponding number of biscuits. Finally, in the last stage, Sarah Boysen taught her protege the converse: It had to choose among several sets of objects, the one whose numerosity matched a given Arabic digit...At the end of this training, Sheba could fluently move back and forth between a digit and the corresponding quantity. This can be considered the essence of symbolic knowledge. A symbol, beyond it's arbitrary shape, refers to a covert meaning. Symbol comprehension implies accessing this meaning from shape alone, while symbol production requires recovering the arbitrary shape from knowledge of the intended meaning." page 37 It is difficult not to think about the many ways this in incorporated into teaching young children. Fascinating. "Otherwise, they [babies] stick to the hypothesis that there is only one object, even if that implies that the object is constantly changing in shape, size and color. Thus, the baby's numerical module is both hypersensitive to information about object trajectory, location, and occlusion, and completely blind to changes in shape or color. Never mind the identity of the object, only location and trajectory matter." page 59 This is interesting, so babies are surprised when the think there should be 1 object and instead there are 2, or when they think there are 2 objects and there is only 1...but seeing 1 bird go behind a screen and seeing 1 truck come out doesn't surprise them at all. "Yet in order to learn something, one must not be to prejudiced." page 59. Dehaene argues that things in the baby's environment often change shape, size, and color...(he used the example of a small piece of red rubber easily and quickly inflating to a large pink balloon), so babies must remain open to the prospect that an object can change all of it's attributes and still be one object. Lots to think about here. I can see some outdated information in this book (which was published in 1997) "Right after birth, they learn to recognize their mother's voice and face..." page 61...but, we now know that babies recognize their own mother's voice even BEFORE birth. I feel that Dehaene contradicts himself on pages 65, 66, when he states, "Georges Ifrah, in his comprehensive book on the history of numerical notations, shows that in all civilizations, the first three numbers were initially denoted by repeatedly writing down the symbol for 'one' as many times as necessary, exactly as in Roman numerals. And most, if not all civilizations stopped using this beyond the number 3 (see Figure 3.1)." but then provides a Figure (Figure 3.1) where actually Cuneform Notation, Etruscan Notation, Mayan Notation, and I might even argue Ancienr Indian Notation (as there are two lines intersecting at a right angle - where you could count the lines from the midpoint as 4 separate lines representing the number 4) DO represent the number 4 (and in the case of Cuneform Notation, the number 5) with drawings of that many lines - just like one, two or three lines are represented with 1, 2, or 3 lines. I love thinking about where things relating to language come from. It was interesting to hear Dehaene surmise that the numbers 2 and 3, "Our digit 1 is a single bar, and our digits 2 and 3 actually derive from 2 or 3 horizontal bars that become tied together when they were deformed by being handwritten." (page 65) I can almost see it in the arabic number 4 as well, if you count each part of the bisected right hand line as a separate line - you get 4 lines! When I was a child I was obsessed with the idea that if you make an invisible "x" in the air with your pointed finger, there is no way to prevent a joining curve to happen between drawing the first diagonal line and drawing the second. That really bothered me as a kid, I remember drawing and redrawing x's with my finger while riding the elementary school bus. So the above quote ("Our digit 1 is a single bar, and our digits 2 and 3 actually derive from 2 or 3 horizontal bars that become tied together when they were deformed by being handwritten." page 65) brings that back to mind, and connects me with the humans of the ancient past, in my opinion. That makes me feel innovative and connected to antiquity. My favorite part of this book by far is the section called, "Do numbers have colors?" This is, of course, because I have always seen numbers in color! Dehaen states, "Between 5$ and 10% is thoroughly convinced that numbers have colors and occupy very precise locations in space." (page 83). I remember the gentleman who wrote "Born on a Blue Day" saw numbers as an undulating, mountain type shape. While that is not the case for me, I am heartened to learn that others see numbers in color, too! So 7/10 of my numbers' colors in some light match up with other peoples. (if you count 5 as a "small number" and count tan as a brown). How is that possible? The colors of numbers is not something we teach children, or learn about as children...after all the majority of people that I have told about seeing numbers in color think I sound a bit crazy. So how can there be similarities across people? Something else is going on here. Dehaene states that, "Most people associate black and white with either 0 and 1 or 8 and 9; yellow, red and blue with small numbers such as 2, 3, and 4; and brown, purple and gray with larger numbers such as 6, 7 and 8." (page 83) I have placed a * next to the number colors that I see which correlate with Dehaene's statement. I don't love that on page 86 Dehaene refers to my special, valuable and in my view instrumental in evolution with respect to human beings, and our language of words and numbers, as "bizarre numerical hallucinations." Il libro è favoloso, anche se probabilmente la mia opinione possa essere influenzato dalla mia passione per le Neuroscienze. Comunque sia, il primo punto a favore è l'autore: non si tratta del solito giornalista scientifico che, eccitato da qualche frase sentita da qualche scienziato, decide di scrivere un libro sulla concezione dei numeri senza sapere niente né di matematica né del cervello. Qui si parla di un matematico che ha preso un PhD in psicologia cognitiva arrivando così ad occuparsi de Il libro è favoloso, anche se probabilmente la mia opinione possa essere influenzato dalla mia passione per le Neuroscienze. Comunque sia, il primo punto a favore è l'autore: non si tratta del solito giornalista scientifico che, eccitato da qualche frase sentita da qualche scienziato, decide di scrivere un libro sulla concezione dei numeri senza sapere niente né di matematica né del cervello. Qui si parla di un matematico che ha preso un PhD in psicologia cognitiva arrivando così ad occuparsi della rappresentazione cerebrale dei numeri e della matematica. Insomma, un tipo che sa perfettamente ciò di cui sta parlando. E si vede: il libro è incredibilmente chiaro, nonostante arrivi a trattare argomenti piuttosto complessi. The Number Sense is Stanislas Dehaene's argument that the human brain is wired to understand numbers, or "numerosity" as Dehaene puts it. Before we acquire language, learn number symbols, learn to count, and basically learn mathematics, we already come equipped to spot when there is less or more of something. Even animals have this number sense which is discussed in the first chapter of the book. Babies and children also come equipped with the "sense" and the second chapter gives many examples o The Number Sense is Stanislas Dehaene's argument that the human brain is wired to understand numbers, or "numerosity" as Dehaene puts it. Before we acquire language, learn number symbols, learn to count, and basically learn mathematics, we already come equipped to spot when there is less or more of something. Even animals have this number sense which is discussed in the first chapter of the book. Babies and children also come equipped with the "sense" and the second chapter gives many examples of this. The book then goes on to explain why going beyond counting and simple addition, mathematics starts to get really weird and a bit difficult for the brain to handle. As a radiologist and medical physicist, I found the early chapters on early childhood development of a number sense and the later chapters on number-processing deficits experienced by brain-damaged patients and brain imaging to be a little slow and not particularly revealing, most likely due to my prior exposure to these topics through my professional training. The middle chapters that discussed how adults think about numbers and do calculations, however, were fascinating. Interesting review of the psychology of numbers. This guy has been featured a few times on the RadioLab podcast, which I love. I think its strength is the really interesting discussion of what animals and humans are inherently capable of when it comes to numbers and mathematics. Its weakness is when it tries to apply evolutionary arguments to the "fitness" of mathematical concepts, which I find kinda dumb. Fun if you're interested in this kind of thing. “La matematica è l’opera della mente umana, che è destinata più a studiare che a conoscere, più a cercare che a trovare la verità” (cit. da Evariste Galois). Si tratta di un libro estremamente interessante, per chi ama saggi di carattere scientifico con un taglio divulgativo. Certamente è assai interessante per chiunque ami la matematica: capire come la mente umana funziona nel momento in cui effettua calcoli e pensa in maniera computazionale è importante. Direi che si tratta di una lettura obbli “La matematica è l’opera della mente umana, che è destinata più a studiare che a conoscere, più a cercare che a trovare la verità” (cit. da Evariste Galois). Direi che si tratta di una lettura obbligatoria anche per chi, come me, s’interessa di psicologia cognitiva e in generale di neuroscienze: capire come il pensiero convergente si sviluppa e si struttura nel cervello umano è fondamentale. Ma è una lettura stimolante e assai utile anche per chi si occupa di educazione alla matematica, ossia per gli insegnanti di questa materia. A questo proposito Dehaene, matematico egli stesso, oltre che psicologo cognitivo, è sempre chiaro, documentato e logico nella sua esposizione, e offre dei suggerimenti assai utili e concreti. Si tratta di un approccio che, peraltro, l’autore utilizza anche nelle sue opere successive. This book has lots of good theories but the author likes to ramble on and on for the sake of filling pages. He even states as much in the beginning on his approach to writing this book. I would recommend it, but don’t feel like you have to read every page, which unfortunately I did. Outstanding adventure into the way our evolved brains intuit about math! This book covers a lot of different subjects to study/explain Mathematical Reasoning. The chapters follow a certain logic, starting with math comprehension in animals, then babies, then adults, and finally geniuses/prodigies. The book is based on intense research from several fields as phrenology, psychology, etc. Then it concludes with a more philosophical discussion about maths as a subject, its existence, its "purity" and matching with physical phenomena. The author describes situations in which humans perceive animals to have a "number sense". It turns out some of these perceptions are erroneous, as in the case of the horse named Hans, which merely responded to the trainer expectations, like an unintended non-verbal communication. In other cases, animals (e.g. rats) can indeed manifest some sort of number understanding, with a certain accuracy. Chimpanzees can also compare quantities, for example. Dehaene describes a few nice experiences with babies, showing evidence that they seem to have some sort of innate "number sense", from birth. After a few months, they are also capable to perform a few simple calculations as 1 + 1 , 2 + 1. The author describes the (natural) evolution of number writings (romans, etc), and the increasing advantage of each writing compared to the previous ones. He also introduces the magnitude effect when comparing 2 numbers (e.g. 4 vs 5 is much slower than 1 vs 9 ),which permeates all the book. Now the object is the (mathematical) language, and how it evolved through civilizations. The Eastern languages, such as japanese and chinese have shorter words for the numbers, as well as more structured "number language", what explains chinese can memorize more digits (9 against 7, on average) than western. This is a very interesting chapter. Stanislas enters in the world of pre-schoolers, when they learn to count, sum, subtract, etc. Basically, in order to be able to produce faster results in these operations children need to refine the algorithms. Just remind when you used to count in your fingers to sum 4 + 3. In this chapter the author also discusses the introduction of calculators in schools, which can help students, despite its bad reputation. The big discussion of the chapter is about innate mathematical talent, and the probable answer is there is no such thing. Although it is hard to separate effects and find any causality, there is positive correlation between math ability and myopia, allergy, first-born, left-handedness. Here the author discusses brain damage and brain plasticity. Even though brain parts can specialize and almost replace completely other parts, in some cases this is impossible. The author show some interesting cases here. This chapter enters into brain location of mathematical reasoning, etc. Chapter 9 - What is a number ? In the author vision mathematics is an evolutionary field, and not as perfect as mathematicians think (an example is the sum 1-1+1-1... which Leibniz proved to be 1/2). Another thing discussed in the chapter is that the axiomatic system , as Peano's axioms, and long chain computations are not as suitable for a brain as it is for a computer. The book ends with discussion on the "unreasonable effectiveness of math". This insightful survey of the brain research around how our humans develop an understanding of mathematics is a fabulous resource. Although it is now 15 years old, the text is completely relevant and useful. Taking into account advances in the fields of psychology, neurology, and other cognitive sciences, Dehaene provides a strong foundation of how our brains make sense of numbers. This "updated" edition basically keeps the main text intact, but adds a tenth chapter on recent brain research with This insightful survey of the brain research around how our humans develop an understanding of mathematics is a fabulous resource. Although it is now 15 years old, the text is completely relevant and useful. Taking into account advances in the fields of psychology, neurology, and other cognitive sciences, Dehaene provides a strong foundation of how our brains make sense of numbers. This "updated" edition basically keeps the main text intact, but adds a tenth chapter on recent brain research with slight revisions to what he wrote in the earlier chapters 15 years before. To me as a mathematics educator, the greatest benefit of this book is what Dehaene offers in terms of how our brains understand number and the implications to education. Namely, he argues persuasively that we are born with a genetic predisposition for a "number sense" that allows us to understand an approximate sense of quantity from birth. As we grow and develop, we refine this predisposition with language that gives us a much more precise sense of number through education and exposure to our culture. The implication for education is that as educators, we need to continue to tap into and nurture our students intuitions about number before we attempt to have them apply abstract rules or algorithms. This seems to reinforce the idea of allowing children to solve contextual problems in an open-format and to share their insights into how they solved the problems with each other as a means of allowing them to develop conceptual understanding of ideas through intuition prior to developing procedural skills. For us as teachers, we need to provide the necessary scaffolding and provide the formal language and algorithms when students have demonstrated an understanding in need of a more precise language. My one criticism of this book is that in the last chapter of the original text, Dehaene steps into the philosophical debate over whether mathematics is created or discovered, and he comes down hard on the side of a mathematics that is a human construction. I tend to find a hard line on this debate to be a bit unpalatable and find myself agreeing more with Mario Livio's stance in his excellent book, Is God a Mathematician, namely that mathematics is a little bit of both a creation and discovery. Sure, mathematics is a language and as such pure mathematics is developed by humans, created. However, mathematics and nature follow rules that aren't governed by human beings. Instead, we uncover these rules and the nature of mathematical objects through exploration or discovery. This book was far more interesting than I thought it would be. Dehaene affably guides the reader through a rather comprehensive history of the study of mathematical cognition. He tours old cognitive psychology theories that oversimplified the neocortex as a generalized association machine and others that over-emphasized the role of language in calculation, and shows us the experimental evidence that supports a slightly more complex rendering. His theory posits that there are two main faculties of This book was far more interesting than I thought it would be. Dehaene affably guides the reader through a rather comprehensive history of the study of mathematical cognition. He tours old cognitive psychology theories that oversimplified the neocortex as a generalized association machine and others that over-emphasized the role of language in calculation, and shows us the experimental evidence that supports a slightly more complex rendering. His theory posits that there are two main faculties of calculation: an evolutionarily ancient, amodal "number sense" derived from mechanisms of spatial cognition that all animals appear to possess, and a language-based code that stores declarative facts of arithmetic, like 6x7=42. To build his theory, he takes us back into the history of number systems, and how they evolved, and how our number sense is still evolving. He finishes his tour in the modern-day classroom, pointing out that there have been several computer-program interventions that have shown remarkable success rates in children. In one particularly successful study, a group of mathematically deficient 3rd graders from England trained three days a week over the course of three months earned the highest marks in their grade on a standardized math test at the end of the year. A follow-up study showed that this success stuck with them through high-school, showing that poor performance in math can most certainly be improved. Intriguing exploration of both the nature of math and the capacity of the human brain to learn it, perform it, and create it. Draws from experimental results from psychology and neurobiology to outline some fascinating conclusions including mathematical abilities we have from birth (tested in infants as young as 3 months!) some of which we share with a broad set of animal species. While his attempts at entering the realm of philosophy of math felt clumsy and over-reaching, the bulk of the book wa Intriguing exploration of both the nature of math and the capacity of the human brain to learn it, perform it, and create it. Draws from experimental results from psychology and neurobiology to outline some fascinating conclusions including mathematical abilities we have from birth (tested in infants as young as 3 months!) some of which we share with a broad set of animal species. Some interesting insights here or there surrounded by a lot of information that I didn't care too much about. Dehaene mentions Asian mathematical wiz-kids in a few places in this book. I would have loved reading more about how Anzan works within the brain, but the reader is sadly left with mere conjecture that anzan is similar to mental calculations made by the adept and well documented, such as Inaudi. Mind and mathematics. I read this book during Summerbridge in 06 when my cognitive science major and interest in mathematics (freshly rejuvenated since I was teaching algebra) collided. Interesting research on how the brain construes numbers & number sense, and how the brain computes. Also presented theories on why some races might be quicker at learning math than others (based on language). I liked it. Compelling, fascinating topic matter. There's a world in those numbers and this book is one of the best guides you'll find. It strikes a sincere balance between psychology and mathematics. Toward the end there's a hint of philosophy. Unfortunately, the book is written like a journal paper (maybe best if read on a chapter-by-chapter basis). In spite of that, the material is so engaging and well-developed that YOU SHOULD READ IT. Repeat it after me 1-2-3- READ IT! excellent book on how the mind creates mathematics. I was initially worried that the tpinformation would be outdated, but dehaene had some great insights most of which were corroborated by future research, which is summarized in the last, lengthy chapter. I read this for the course taught by one of Dehaene's collaborators, and both the book and the lectures were incredible. What a fascinating book! Have you ever wondered how the brain processes numbers and mathematical thinking? Dehaene gives great explanations and an overview of brain research. If you teach math, this will help you understand kids' mathematical development, and how to take advantage of the way their brains work to effectively teach math. An interesting read. I found the chapter on losing number sense quite fascinating. However, I found other chapters dragged on a little bit. A lot of neat tidbits of information, but I found it read a bit like a long review article more so than a book. More psych, less math. Worth reading. If I could give .5's this would be a 3.5 rating. Besides an overly enthusiastic usage of the phrase "in the final analysis," this book is near-flawless. Thorough, accurate, insightful, useful, even damned funny in parts . . . call me a Dehaenophile through and through! It will appeal most to those interested in the intersection between neuroscience and math education. It's both factually dense and beautifully written. Loved it. This is a fascinating books for math teachers. Others may find it a bit dry. Some very interesting facts about how we form or rather we as kids form our number sense. It was fun to read about all the experiments researchers design to study number sense. Must read for math teachers. I feel for what my less mathematically inclined students go through. Also just plain interesting. Such a great book and i would recommend highly as a good read.